Unicorn Dips His Horn II tapestry shows a scene from the Hunt of the unicorn series of tapestries. The original was created in 1495 to celebrate the marriage of Anne of Brittany to King Louis XII of France who ruled France from 1498 to 1515. Here in this scene we see hunters gathering in close on the unicorn, which possess healing powers and ability to turn poisonous water to purity it. Here the unicorn is dipping his horn into the water of the fountain to cleanse it of venom to allow the other forest creatures to drink from it. The entire scene is decorated with foliage and flowers characteristic of the mille fleur backdrop of medieval art. 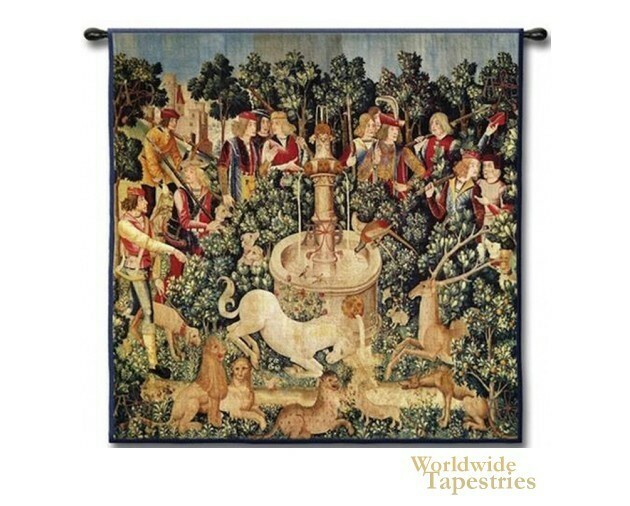 This unicorn tapestry Unicorn Dips His Horn II is backed with a lining and a tunnel for easy hanging. Note: tapestry rods and tassels, where pictured, are not included in the price. Dimensions: W 38" x H 38"